Looking for a clean, well-cared for 2015 INFINITI QX80? This is it. In their original incarnation, SUVs were chiefly owned by folks who valued "utility" above "sport." Not anymore! The INFINITI QX80 redefines the SUV and makes the perfect "all around" family companion. Sophistication & understated luxury comes standard on this INFINITI QX80 . Well-known by many, the QX80 has become a household name in the realm of quality and prestige. One of the best things about this INFINITI QX80 is that it has low, low mileage. It's ready for you to truly break it in. 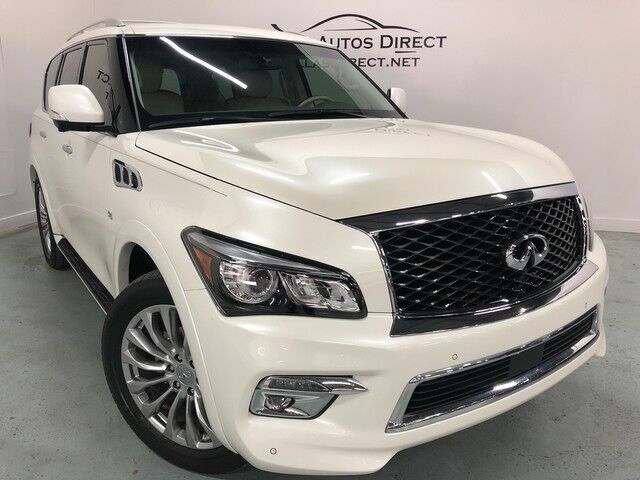 More information about the 2015 INFINITI QX80: The QX80 is a large luxury truck that is both elegant and comfortable, yet its body-on-frame layout allows a tow rating of up to 8,500 pounds. Ride comfort and handling are also quite good and the big 5.6L V8 and 7-speed automatic make an agreeable pair with strong responsiveness. Three rows of seating accommodate up to eight passengers, which makes the QX80 a good pick for families. Inside, the cabin is a standout, with a quiet, refined feel, lots of standard and available technology and great ride quality. Interesting features of this model are refined ride, Strong V8 powertrain, three rows of seating, available safety and entertainment technology, and quiet cabin Finance available with applicable fees.